William Stewart Ross was educated for the church in Glasgow, but he was more interested in literary subjects. He was influenced by the works of Burns and Carlyle and became an ardent freethinker. He wrote under the pseudonym Saladin and published essays on secularism, like "Roses and Rue" (1891). In 1879 he won a prize for a poem on Robert Burns. In 1888 he became the editor of the Agnostic Journal. It merged with Secular Review in 1889 to become Agnostic Journal (& Secular Review) and it existed until his death in 1906. During the last years of his life he worked from his bed. Work: "God and His Book" (1887); "Biographical Dictionary of Freethinkers" (1889); "Roses and Rue" (1891). 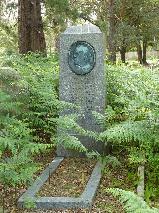 The grave of William Stewart Ross ("Saladin") at Brookwood Cemetery, Woking.